MDS crafts environments that enrich the user experience and help our clients' programs thrive. MDS/Miller Dyer Spears is an architecture, planning and interior design firm based in Boston. We work with institutions, schools, public agencies, developers, and communities, and specialize in a range of project types that foster innovation, learning, creativity and wellness. We are proud of the many long-standing relationships we have developed with our clients, many of whom we have served for decades. As a participant in the AIA 2030 Commitment, MDS tracks and reports energy performance metrics of our projects to the national Design Data Exchange (DDx). We are proud to work with our clients to design innovative solutions that help reduce energy usage and combat the effects of climate change. Read more. We are pleased to announce MDS/Miller Dyer Spears is now a Women Business Enterprise (WBE), certified by the Massachusetts Supplier Diversity Office. We recognize a talented and diverse staff is essential to the success of our planning and design projects and are proud these values are reflected in our firm’s leadership. MDS celebrates with Boston Collegiate Charter School on the dedication of its Mayhew Street School Expansion. 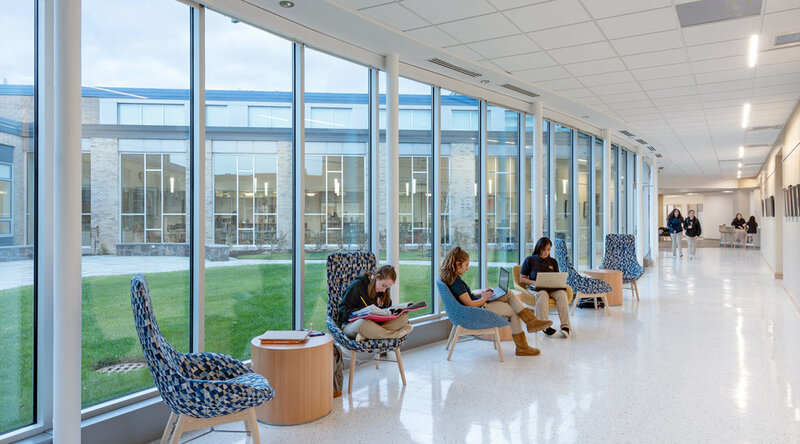 This project added vital gathering space and 13 classrooms to BCCS’s middle and high school facilities. Read more. Our comprehensive renovation with Shawmut Design and Construction of Boston University’s Myles Standish Hall and Annex received a Silver Award from the Design Build Institute of America New England Chapter. Read more. We welcome new business inquiries. Please contact us to discuss how MDS can support you in your architectural, planning or interior design project. Visit our Careers section to learn how to join our team.